as usual, we are not getting tired of exploring different countries and provide you with some market insights that could be very helpful for your campaigns. This week we have decided it will be one more country for which Zetaniche has many products to offer for promotion and that will be – lovely Slovenia. Before we start sharing you some affiliate tips on this market, firstly we like to point out on some interesting fact on country itself. Bordered by Italy to the westm Austria ti the north, Hungary to the northeast, Croatia to the south and southeast, and the Adriatic Sea ti the southwest. Capital of Slovenia is Ljubljana. 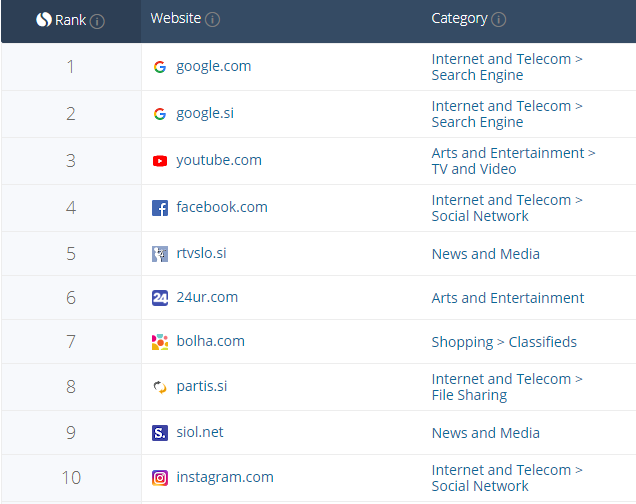 According to data from December 2017, there was in total 1,663,795 internet users in Slovenia, which makes 79,9% of total population. In the first quarter of 2017, 79% of persons between age 16–74 used the Internet. 68% used the internet every day or almost every day (which makes increase of 4% comparing to 2016). However, there is 18% of persons aged 16–74 years that never used the Internet. Of course, internet usage still remains the lowest among older generation but it is important to mention that its trend is also in increase. The internet was regularly used by 83% of persons aged 45–54 years, 56% of persons aged 55–64 years and 39% of persons aged 65–74 years. Among people who never used the internet were mostly persons between 65–74-year old. 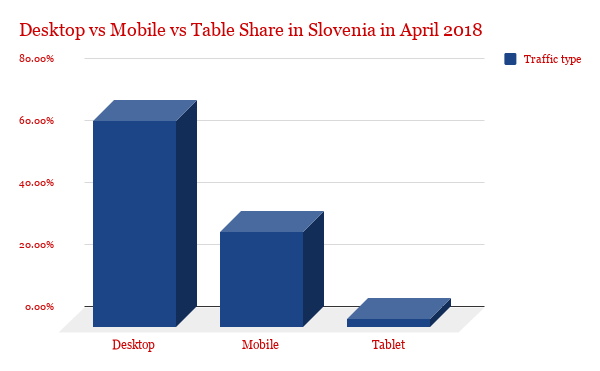 Desktop vs Mobile vs Tablet Market Share in Slovenia in April 2018 was: Desktop (66.47%), Mobile (30.76%) and Tablet (2.77%). 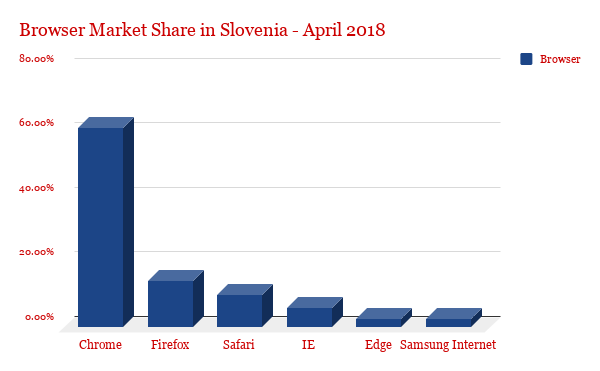 Browser Market Share in Slovenia in April 2018 was: Chrome (61.95%), Firefox (14.27%), Safari (10.03%), IE (5.97%), Edge (2.56%), Samsung Internet (2.55%). Operating System Market Share in Slovenia in April 2018 was: Windows (59.43%), Android (25.51%), iOS (7.55%), OS X (5.84%), Linux (0.99%), Other (0.55%). 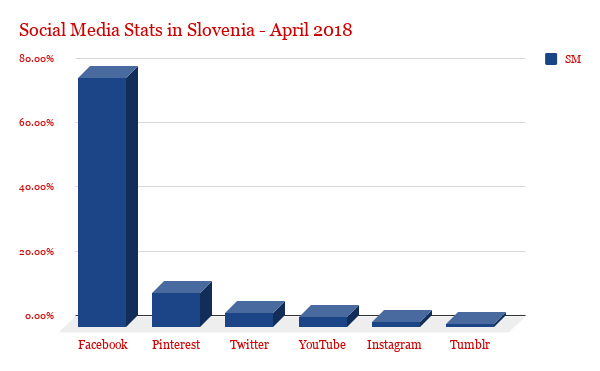 Social Media Stats in Slovenia in April 2018 were: Facebook (77.65%), Pinterest (10.67%), Twitter (4.47%), YouTube (3.16%), Instagram (1.60%), Tumblr (1.09%). Don’t let the fact of small country fools your. When it comes to Slovenian consumers, their spending behavior is the closest to consumer behavior in Western Europe. They are well-informed, prefer local and renowned products and over a third of the online population uses different websites to make a research over products before buying them. As the purchasing power improves, the share of leisure products and services in total spending has increased. The largest share of online shoppers is in the age group of 12-24 years where 96 percent of all internet users shop online, of these 39 percent shop online at least once per month. In the age group of 25-34 years the proportion of online customers amounts to 95 percent. In this demographic group there is the largest share of intensive purchases – almost half of internet users make online purchase at least once a month. As expected, in the age group of 45-84 years the share of online shoppers is the lowest and it amounts to 73 percent of all internet users. When we look at demographic group, we will find that 35% of individuals aged 16–74 years purchased online in the first quarter of 2017. The majority of online buyers performed 1–2 purchases online (47%), 36% 3–5 purchases online, 12% 6–10 purchases online and 5% more than 10 purchases online. As for the value of online purchases, the estimated value in the first quarter of 2017 was between 100 EUR and 499 EUR (32%). 31% of online buyers made online purchases in the estimated value less than 50 EUR, 27% between 50 EUR and 99 EUR and 4% between 500 EUR and 999 EUR. Cash on delivery seems to be the most popular and accepted payment method in Slovenia with penetration of 53%. This is due to a long tradition of cash transactions. Currently, about 53 percent of consumers in Slovenia pay by handing over cash when their goods are delivered. However, the use of electronic payments has been increasing in recent years. Almost a fifth of purchases is completed with credit card, which is 12 percent more than the year before. Why to start promoting Zetaniche offers in Slovenia? Though this is a very small country, but with definitely big potential that you should not close your eyes on. Various offers in some of the most popular niches. Well, Slovenia doesn’t seem so small now from the affiliate angle, right? It actually gives many opportunities that you definitely should not miss. We really hope you will also recognize it’s potential as we did, and that we manage to provide you with helpful information that you will be able to use. In case you have some questions left, we are always at your disposal. Contact Zetaniche support for any additional information you might have or assistance in starting to promote Zetaniche offers.